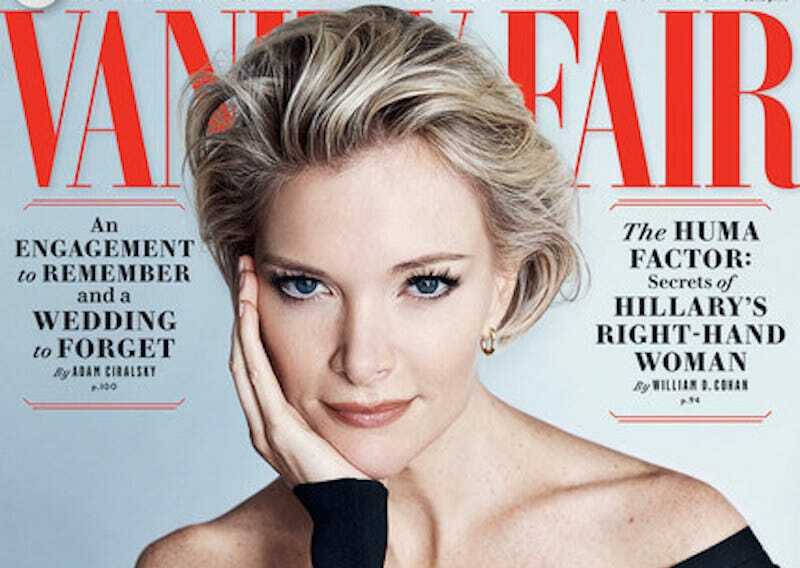 Fox News anchor and Kelly File host Megyn Kelly is featured on the cover of Vanity Fair’s February issue, revealing an array of interesting tidbits—she was violently ill during the August GOP debate, Donald Trump used to send her fan mail, her personal stance on abortion is still unknown—and a somewhat worshipful perspective. This is not unusual in coverage of Megyn Kelly (I myself once referred to her as a “hero”), because she is indeed a fascinating and exciting enigma, the lone member of Fox’s flock of beautiful blonde anchors who wrestled her way up to out-perform and outwit her male colleagues and subjects; according to the profile, she makes $6-$9 million per year. My colleague Kara Brown has referred to her appreciation of Kelly as “one of the most confusing relationships of my adult life”—because although Kelly is terrifyingly poised and often fearlessly critical of her own in a way that is deeply satisfying to the media, she is also someone who once did 45 separate segments on the New Black Panthers and lamented the concept of a black Santa. This is what’s fascinating about Megyn Kelly—how her expressed ideologies compete with her actions; how feminism applied on an individual, one-on-one basis only becomes something entirely conservative. And as interesting as it is that she did the Cleveland debate with a barf bucket next to her, or that Donald Trump, before his run, “called from time to time to compliment a segment,” the subtle hypocrisies that have propelled her to fame are the real story.